Study space where you learn has a big influence on your results. 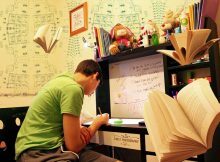 In this article you will find some advice how to change or prepare your study room for learning. Let’s start from choosing the study room. I know that sometimes you have only one room where you can learn but if you have choice it would be the best to choose big, sun-lighted room. The most motivating colors of walls are red and orange. If you would hang big mirror on a wall it would optically enlarge the room. Good temperature also have influence on your mood for learning. It should be between 20 and 22 degrees Celsius. Study room should be also aired before learning because more oxygen helps you to think. In winter when air is dry you should use special humidifier or put wet towels on radiator. Now something about furniture. Try to make your room cozy but remember you have to learn there. When you enter the room you should feel motivated to work, not motivated to fall asleep. You can put a carpet on a floor because it will deaden the noise. Some people claim that they like to learn while lying on a bed etc. It’s not a good idea, a bed is intended for sleeping, when we lie on it our mind thinks “Oh, I’m on a bed I should fall asleep”. Your study desk should be big enough to contain notebooks, books and laptop. We should also have order on our study table because if we would have a mess it would distract us all the time. Other good advice is to have a bottle of water on the desk because if we want to drink something we wouldn’t have to go to the other room and stop learning. Have you ever experienced late night studying or last minute cramming the night before the exam? If the answer is Yes. Don’t worry, I know how you can help yourself but.. first you have to know that everyone is completely different from another so your study techniques also should be completely individual. Drop a comment below let’s us know how your study library is.